The RainGear 2-speed wiper system is a modern, high quality system that is completely hidden within the airbox in the cowl area behind the firewall. 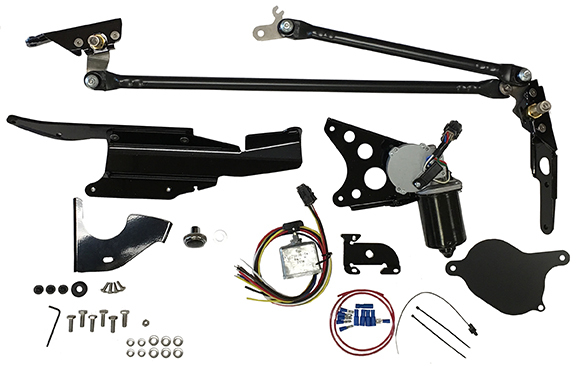 This system replaces the original wiper motor and includes a plate to cover the hole where the original mounted. The result is a cleaner firewall along with a new high-quality wiper system. This system includes a wiper switch that must be used because the RainGear system is controlled by switching the positive wire instead of the ground wire like the GM switch does. This RainGear system is the 2-speed motor without the delay. For the 2-speed system with the delay, see WW-RG72D, WW-RG82D, or WW-RG92D.